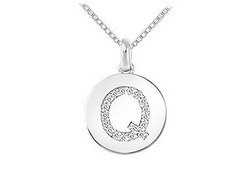 Beautifully made in polished 14K white gold disc pendant is inscribed with the letter "Q". This alphabet is embellished with brilliant-cut round diamonds with a total gem weight (TDW) of 0.20 carat. This initial pendant dangling from standard 16 inches gold chain. Wear your identity symbol.